We have taken the best of our designs and combined them with our latest patented and patent pending components to create a true snow and wind predator. The Snow Predator™ readily adapts to the job and environment. For ski slopes it is crucial to move fences for seasonal use or snow farming. For highways and rail roads it is important to have a choice of installation methods and adjustable porosity depending on the conditions. For mining, oil, and gas exploration, the Snow Predator™ adapts readily to their unique environments. The Snow Predator™, the latest component sleeve system utilizes our new 6 inch rail and adjustable bracket. Every component is designed to enhance the system. 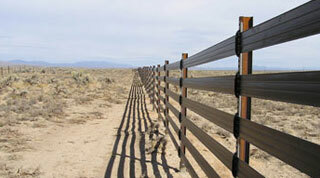 Like any great Predator every fence is tailored to your specific needs. 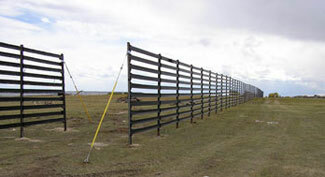 Send mail to perma@ida.net with questions or comments about this website © 2005 Perma-Rail International Inc.
Perma-Rail International Inc. designs and manufactures snow fence, wind fence, and dust control fence.